Chris Kennedy and Mark Wandrey present the tenth book in the Revelations Cycle series. First contact has been made, and Earth's militaries and its premier mercenary companies stand ready to take their first tentative steps outside the Solar System. 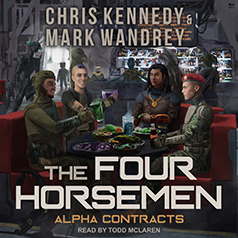 With a galaxy of aliens to explore and fistfuls of credits to be made, follow along as the Four Horsemen select their contracts and venture forth to meet their destinies. Cartwright's Cavaliers, Asbaran Solutions, Winged Hussars, and The Golden Horde stand ready and willing to take on the adventure, but what will they find in their Alpha Contracts, and how will they overcome it? Alpha Contracts will take you behind the scenes of Earth's legendary heroes, giving you a merc's eye view of the dangers they faced in completing their first contracts, as well as a look at mercenary warfare among the stars from a fifth company, the Avenging Angels, as its members send letters home from the front lines.